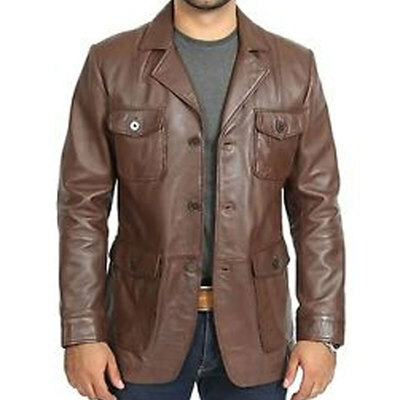 The style and bravura for the leather jacket is never old. Presenting you an outstanding yet sophisticated outer wear in 70’s style jacket which you can wear as casual and formal wear. The attire is luxurious in looks indeed and crafted from 100% pure leather externally while the inner material is also focused the comfy viscose lining is stitched as an inner fabric. The long jacket offers ultimate classy looks as featuring coat styled turn down collar front YKK zip closure and belted cuffs. Got bored of your old cropped funky jackets and looking for something decent then just add it into the cart and enjoy your elegant yet modish looks. visit by celebs outfits.